A Santa Maria group wants to protect key features of the city’s oldest park, including a concrete sidewalk shaped like a California Mission bell. But Buena Vista Park’s signature feature is not expected to survive the massive renovation planned by the city, according to an approved designed. The park sits at the corner of Morrison and Thornburg streets. Members of Buena Vista Beautifiers — a group of residents eager to revive the park that is more than 100 years old — lobbied the Recreation & Parks Commission to protect the bell-shaped sidewalk and other features. “There’s a lot of history in that park and we need to simply renovate it. Please, do not tear it out and rebuild,” said Dottie Lyons, a local resident speaking on behalf of the Minerva Club. She urged the city to protect the trees, many of which were planted by the Minerva Club, the nation’s oldest woman’s club formerly known as the Ladies Literary Society. 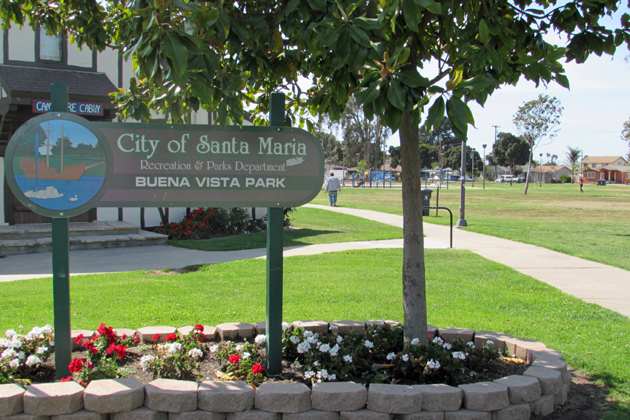 The park is listed as a Santa Maria landmark. “It seems insane to rip out a perfectly good sidewalk that has a historical significance to us and the circle where the playground is at the top of the bell. The whole thing, if you look at it from above, has a really nice feel to it,” said Ken Hough from the Santa Barbara County Action Network. 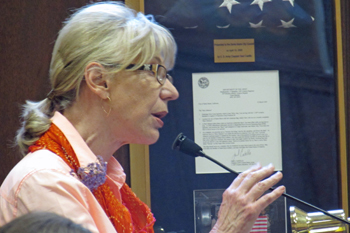 Buena Vista Beautifiers member Jeanne Sparks asked for the commission to reconsider the park design, noting it’s “one of the last remaining items planted by the Minerva Club, whose members were responsible for the city’s incorporation. “You’re not honoring the history. You need to honor the history and work with the people. If you’ve seen the design overlay that was put up there earlier you can do a lot of what the city wants without tearing out what’s already there,” said Sparks, also from SBCAN. Over the two years, the Buena Vista Beautifiers surveyed more than 200 users about park amenities, but those opinions have been marginalized, said Virginia Souza, president of Buena Vista Beautifiers. “We’re standing before you today to say we don’t think any citizens should stand for this kind of heavy-handed, top-down government,” Souza said. Recreation & Parks Director Alex Posada said Friday afternoon that the commission and City Council have already approved the park’s renovated design, and the most recent meeting sought comments on bike racks and other similar features. Park supporters said the bell-shaped sidewalk could remain under the city's approved design. However, Posada said that parks maintenance staff prefer not to have concrete or obstacles in the grass while mowing. Posada, who has worked for the city since 1979, said the bell-shaped sidewalk was installed during a renovation in 1994 and does not have any historical significance. One new feature proposed for the park under the $1.4 million project is a historic gateway element at the main entrance, using tiles to tell the story of Buena Vista. The tiles will be similar to those used on bridges crossing Highway 101 in Santa Maria. Posada said the plan calls for using children to design some of the art on those tiles to depict life around the city and the park’s history. Additions will include an expanded and multi-age playground, three basketball courts, three tetherball areas, new restrooms, and rolling landscape surrounding a small playfield area. Three areas will remain as open areas for large gatherings or community events. Landscaping will consist of more drought-tolerant plants and trees, and the use of turf will be mainly in the playfield area, city officials said. A raised entertainment area for concerts will sit at the center of the park. Since the city is awaiting grant funding expected this fall, work on the park renovation project is expected to begin in a year.